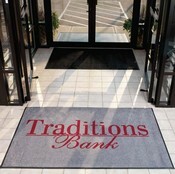 Make the best first impression with a Prestige Logo Mat. These impressive mats feature your custom logo, printed on high quality carpet in up to 8 colors out of a 27-color palette. Choose from portrait or landscape orientation to best suit your needs. Available in sizes from 2'x3' up to 6'x20', in 1' increments. No artwork setup fees, no minimum order quantity. Special all-rubber backing ensures stability on carpeted and hard surface floors. For indoor use only. Actual printed colors may vary from colors shown in chart. *Many more sizes available; please call for pricing and ordering.